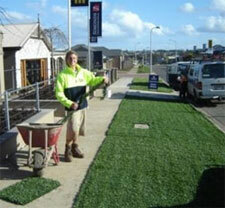 Is yours the best looking lawn in the street? Tired of wasting precious spare time mowing lawns instead of relaxing with family & friends? 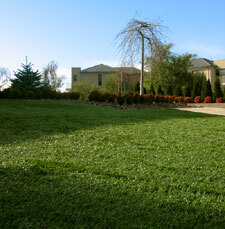 ‘SmartGrass’ is the solution. ‘SmartGrass' is a durable, synthetic grass designed to replicate the look and feel of real grass, with very little maintenance. All you need is a plastic rake to run over it about once a month to keep the blades looking perfect. However, approximately every 3-6 months, we recommend your lawn is professionally groomed by one of our installers to keep it looking and feeling superb. 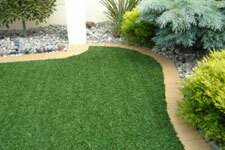 It’s ideal for every area of your home; around the pool, front lawns, and back lawns. Whether it’s running around, playing soccer or footy, ‘SmartGrass’ is soft enough for even the smallest member of your family, no prickles to stick into their bare feet. Pets are no problem either. 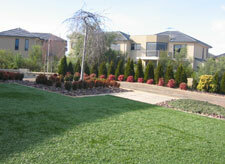 Incorporated into your landscaping, ‘SmartGrass’ enhances all aspects of your home. 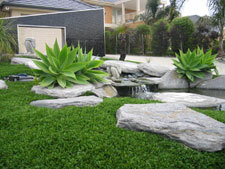 Rock gardens, fish ponds or roof top gardens are just a few ideas we can help you with. 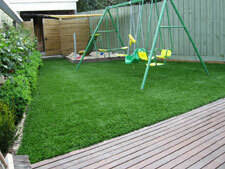 Call us on 1300 887 831 to discuss how SmartGrass can work in your home. 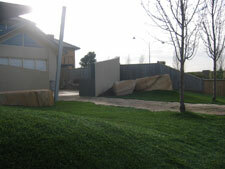 My backyard was unsightly and unusable because the dogs had dug up everything, I needed help. I contacted the team at SmartGrass and they turned my ‘moon-crater’ like dustbowl into a wonderful, green lawn. Even the dogs love it, thanks. 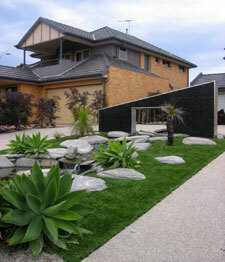 All my friends and neighbours comment on how terrific my lawn looks since I had SmartGrass installed. 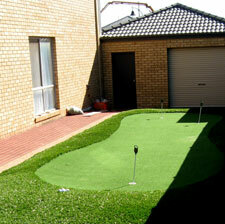 I love entertaining and am quite proud to show of my backyard that is green all year round. For all the years of fun ahead, I say a big thank you to all the guys.